Eating out in Italy is nothing like it is in the States. 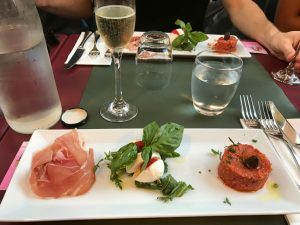 There are many expectations around eating out that we’ve grown up with at home, but those all need to disappear once you move across the ocean, especially if you’re moving to Italy. Italians don’t eat to live; they live to eat. On a food tour organized through SAI, we started off with this appetizer plate. One of the first, and main differences that you’ll notice when eating out in Italy is the service. Your server will bring you your food and drinks, and that’s about it. Once you have your food, you likely won’t be seeing your server again, even once you’ve finished eating. They may clear away your empty plates, but you will need to ask for the bill, otherwise you will sit at the table all night long. Which means, if you need anything else or any refills, it’s best to ask for those as soon as they set your food down, as they likely won’t check on you during your meal. 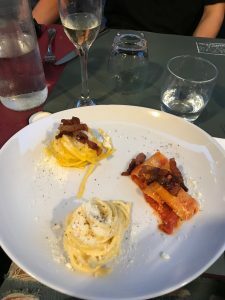 On the same food tour, our main course consisted of a few different pastas for us to try. With that said, tipping isn’t expected in Italy, along with most of Europe. If you would like to, and feel your server deserves it, you’re welcome to tip, but there’s almost always a service fee already included in your bill, so there’s no need to tip on top of that fee. In general, you can expect to spend at least an hour eating out in the States, but expect at least twice as much time to eat out in Italy. One reason a meal takes so long is because Italians aren’t in a rush as Americans are, so slow down and take your time to enjoy your meal. You’ll grow to appreciate the meal and experience more that way. Another reason is that Italians usually order multiple courses. They won’t order just a main course; they’ll start with an appetizer, possibly get a first and second course, and finish off with a dessert, perhaps along with a dessert drink. It’s also common to share courses, which is why they can eat multiple courses; they aren’t eating everything on their own. 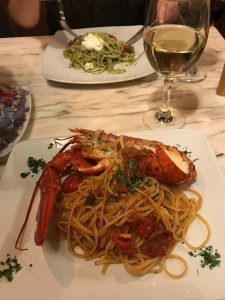 A delicious pasta with a whole lobster at a restaurant in Trastevere. Another important part of eating out is drinking. There’s technically no legal age for drinking in Italy, especially with wine. Italians start drinking wine at a young age, so are very experienced when drinking and know how to handle their liquor without getting drunk and making a mess of themselves. In Italy, wine is the equivalent to water, but they don’t consume it like water. On that note, water isn’t free. You will get an option of still or sparkling water, and it will be in a bottle, not out of the tap, which is why they charge for water in almost all of Europe; unless you specifically ask for tap water then it should be free. Otherwise, it’s normal, almost expected, to order a drink with dinner, but not eight drinks. Control yourself and don’t get sloppy; it’s very frowned upon. Enjoy a glass or two with your dinner and don’t leave stumbling. 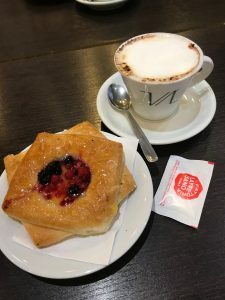 A cappuccino and pastry from Bar Lelli, my favorite cafe. Finally, another very important part of Italy is their coffee. They take their coffee very seriously and take a lot of pride in it too. You’ll find that most Italians are very opposed of Starbucks and other big coffee chains. They like their coffee, and only their coffee. Knowing that, their coffee is very different from ours. They don’t have a selection of different sizes, flavors, and substitutions like we do. They have espresso, and you can either drink a shot of espresso, or add some milk to make it a cappuccino. 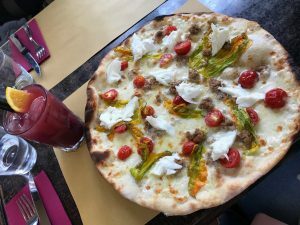 My favorite pizza that I had while in Rome. There are obviously a few more options besides a cappuccino and a shot of espresso, but they are very simple with sugar being about your only option of add-ins. Cafes are also very different from ours back in the states. They are small, usually with very little room to sit down. Unlike eating out, coffee is a very quick ordeal. You order your coffee, drink it in a minute or two, pay and leave. Italians don’t sit around and chat while drinking a large coffee; they drink their coffee and are on their way again. As someone who likes to sit at coffee shops back home with a large coffee and do homework for hours on end, this was a little hard to get used to at first, but I found a café I really enjoyed, got to know the staff, and ultimately came to appreciate the Italian coffee culture. Nicole was a fall 2018 SAI Rome student from Minnesota State University, Mankato.